Located near the village of Riebeek Kasteel in the Western Cape is a small, highly focused family winery whose wines draw praise from around the globe. Mullineux & Leeu Family Wines (MLFW) produces hand-crafted wines from the granite and schist based terroirs of the Swartland region of South Africa. The Swartland is a beautiful and wild place of rolling hills with a few significant outcrops of rock that form the Paardeberg, Kasteelberg and Piketberg Mountains. It is not an easy place to establish vines, and it's a region that has as much of an influence on the vineyards and people who farm there as the people have on the land itself. Roundstone Farm, located on the southwestern slopes of the Kasteelberg mountain, is one of the best areas in the Swartland for growing grapes, thanks to its deep bedrock of schist soils. Acquired by MLFW in 2014, Roundstone Farm serves as the base for both the Mullineux and Kloof Street labels. Here, sustainable, organic farming practices are honored. No herbicides, pesticides or other systemic fungicides are utilized. Soils are nourished from cover crops planted in winter and locally produced organic mulch and compost. The Mullineux team takes a careful minimalist approach to making wines that express the natural wild spirit of the Swartland. In the cellar, apart from minimal amounts of sulphur, nothing is added to, or removed from the wines. Mullineux uses no yeasts, acids, tannins, enzymes, or fining and filtering agents. Proprietors Chris & Andrea Mullineux were brought together through love of the land, making wine and each other. Born in Cape Town and raised in Johannesburg, Chris was introduced to the world of wine while studying accounting at the University of Stellenbosch. He enrolled in winemaking for a second degree, and upon graduation, he took a position starting up a boutique organic winery in Tulbagh, where he oversaw the vineyards and cellar for 5 years. In addition to stints at de Trafford and Rustenberg wineries in South Africa, Chris worked harvests at top wineries in Cote Rotie, Bandol, the Languedoc, Roussillon, and California. A native of San Francisco, Andrea developed her passion for wine at the family dinner table. After studying Viticulture and Oenology at UC Davis and completing a handful of harvests in the Napa Valley, Andrea decided to broaden her winemaking knowledge overseas. After a harvest in Stellenbosch, she went on to work in Chateauneuf, where on the same trip she met Chris at a wine festival in Champagne. Andrea's love for South African wine (and Chris) brought her back to South Africa, where they learned that their compatibility extended into the vineyards and cellar. 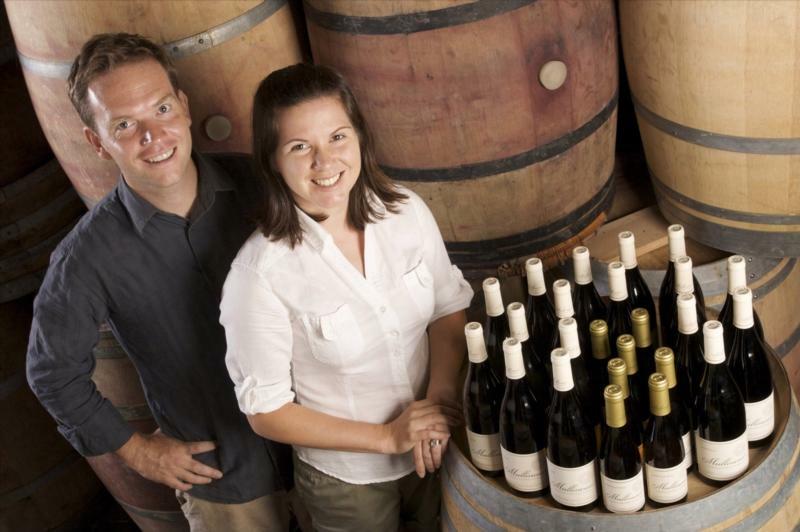 Chris and Andrea established Mullineux Family Wines in 2007 and in just a few years earned critical acclaim. By 2016, Mullineux had received 17 five star ratings from Platter's South African Wine Guide and was named Winery of the Year in 2014 and 2016. Andrea was named Winemaker of the Year in 2016 by Wine Enthusiast Magazine (2016). In 2013 the winery was renamed Mullineux & Leeu Family Wines when Chris and Andrea joined forces with Analjit Singh, proprietor of Leeu Estates in Franschhoek. Analjit's love affair with South Africa started when he first visited the country with his daughter for the Soccer World Cup in 2010. He took a side trip to the Franschhoek valley and felt a deep connection and sense of place. He subsequently purchased 3 adjacent farms which are now part of his Franschhoek hospitality portfolio, Leeu Collection, under the name Leeu Estates. The Afrikaans word leeu (meaning lion) is the Sanskrit derivation of Singh. Tim Atkins 94 "Texture is very important for us,” says Chris Mullineux of this brilliant blend of mostly Chenin Blanc with Clairette, Viognier, Grenache Blanc, Sauvignon Gris and Semillon. Rich, dense and mouth filling, it’s savoury, honeyed and subtle with fine-grained oak and balancing acidity. Wine Advocate 94 "Mullineux's 2013 Syrah includes about 80% whole bunch fruit as it was a cool year from seven different vineyards (five schist, one granite and one on ferrous soils). It has a blackberry and cranberry leaf-scented bouquet, and a pleasant herbal note with rose petals coming through.